This blog was originally posted on Unheralded.fish’s Facebook page Monday. It did not exist by that name the day I was born. But has every day since. Along with being a No. 19 draft choice in the Vietnam lottery. The closest I have come to winning a lottery. Then the Paris Peace Accord intervened. It’s the 100th anniversary of Armistice Day — which was renamed Veterans Day on June 1, 1954. One hundred years seems rather vague. Unless you have some crisp family stories. Many of my Liverpool Kinsey relatives could have used a Paris Peace Accord. They died at an alarming rate in World War I. But not that wascally wabbit and bigamist, Reuben Kinsey. Reuben survived the Second Boer War, World War I and beat a court-martial rap for “serving liquor to officers of a lower rank.” I’m confident he dodged other poor decisions while serving England. He had nine kids by two women, to whom he was married simultaneously. A common TV sitcom plot in the 1960s had someone liked Rob Douglas on “My Three Sons” faced with an evening in which he had two dates. For some contrived reason couldn’t break one. What passed for chaos on 1960s sitcoms ensued. Naturally, the two-timer got his comeuppance in the end. We don’t know if Reuben got his. Seems that he ditched both families and vanished into thin air. For those of you scoring at home, Reuben was declared “presumed dead” in 1943. If he was alive then, he was 73, and not protesting the verdict. Two of his sons were less elusive. One of them lives on digitally. Bertram, 25, can be found as a topic of discussion on a World War I Internet board for getting shot in the head while retrieving wounded on the Gallipoli Peninsula. The marine, musician and stretcher-bearer survived one awful night on a ship before — and this is the apparent curiosity — being taken ashore to be buried. During which his body was lost. Bertram is commemorated at Helles Memorial in Turkey – along with just shy of 21,000 other servicemen with no known grave who died in the Gallipoli Campaign. There were about 75,000 British and Irish casualties in that allied failure. 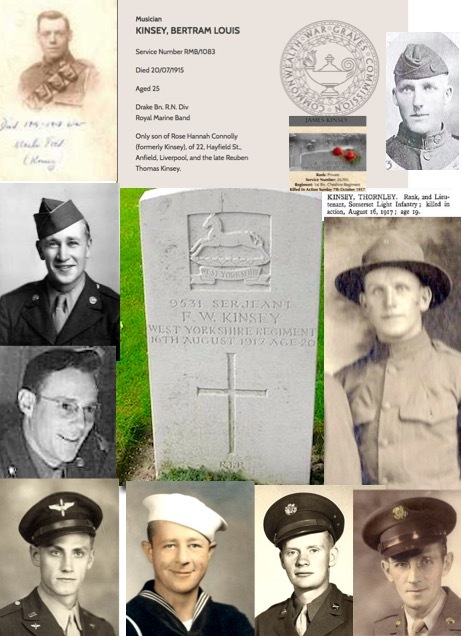 This 75,000 isn’t a total for World War I. It’s a total for one costly part of World War I.
Frederick, 30, James, 27, and 19-year-old Thornley were among other Kinseys on Mom’s side who died in the “Great War.” Stepbrothers Freddie and Bertram were Rascally Reuben’s kids. One per undivorced wife. Their short lives might have been as blemished as Reuben’s. I like to think not. Because that sets up the “llfe ain’t fair” scenario in which the rascal cheats death while the good guys die young, presenting the chance to wax philosophical. Have at it if you like. It’s Veterans Day. Time for reflection. Represented above are some of the 20 relatives from the two world wars. Eight never got home. Among the official World War II portraits here, you’ll notice Dad the Sailor is smiling. A good plan. Not an Eisenhower-level plan. Shot at on land, sea and in the air, Dad wound up sleeping on a dot in the middle of the Pacific Ocean, where he survived a historic typhoon. His ship did not. Dad ate nothing but coconuts and SPAM for a stretch. We didn’t have SPAM in our house. He never ate coconut.